We celebrated Easter yesterday, and we were so happy to see the good weather for the first time in weeks ! A bit to cold, but a lot of sunshine. 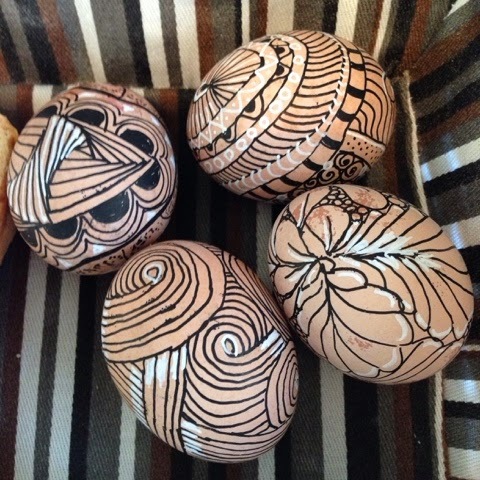 I zentangled some easter eggs. I must admit it is a lot more difficult than tangling on paper. But still a nice result. I used the black and white Posca pens I bought a while ago. And my teacups I zentangled with these pens ? Hm... it was not a good idea to put them in the dishwasher, so most of the tangles are already vanished. I 'll start again and wash the cups by hand then :(. Or I'll choose some other objects to tangle on.